Moore Make Up Experience: Go Pink! All month beauty companies are giving back by raising awareness and donating millions of dollars to help fight Breast Cancer. Purchasing a Pink Ribbon product is a perfect way to treat yourself and help others. Over the years, we have seen more and more companies get involved which is so exciting! 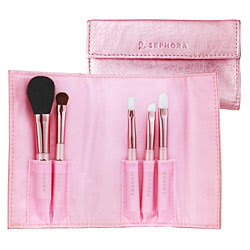 We found this great little brush set from Sephora- perfect to throw in your purse to help get you through the day (includes a powder,eye shadow, brow, lip, and concealer brush), and it's only $15.00! You can touch up your blush and smile, knowing you may in fact have "touched" someone else's life by buying this product!